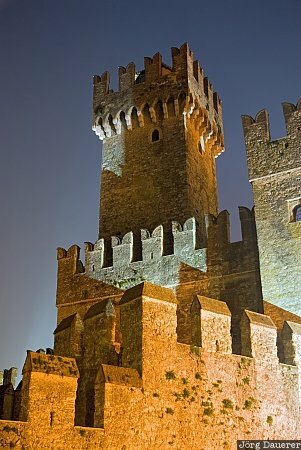 A flood-lit tower and walls of the spectacular Scaliger Castle (Castello Scaligero) in Sirmione at the southern shore of Lake Garda (Lago di Garda) at the blue hour just after sunset. Sirmione is in the province Lombardia in northern Italy. This photo was taken in the evening of a sunny day in October of 2010. This photo was taken with a digital camera.